The project lines up with President Macron's dreams for the country—assuming it succeeds. Uber’s self-driving car program—from shuttering its Arizona outpost to making Pittsburg’s mayor angry—is not doing well this week. Their flying taxi initiative, however, is, dare we say, taking off. The company announced today in a press release that they’ll be opening an Uber Elevate research station in Paris. Its researchers will spend the next five years, and $23.4 million, researching how to navigate air traffic and comply with European regulations. This is Uber’s first flying car lab outside the U.S., but it shouldn’t come as a huge surprise that the project landed in France. President Emmanuel Macron announced a year ago he plans to make France a “start-up nation,” and he’s been trying to make good on that promise ever since. Besides the Uber deal, France made a few major advancements towards that goal this week: Facebook will pay for 48 artificial intelligence fellowships at French universities, IBM will create 1,800 tech jobs in the country, and the food delivery start-up Deliveroo will invest about $117 million in the next few years, reports the BBC. Local governments have made progress on hosting start-ups, too, by offering space for Hyperloop companies to build test tracks. Limoges, France attracted Canadian start up TransPod with construction space for a prototype. In a similar deal, Orleans, a city farther north, will likely host native-grown SpaceTrain, reports Bloomberg. The most ambitious of all these plans, however, still appears to be Uber’s flying taxis. This is in part because air space is highly-regulated, and it’s not clear yet what categories these planes will fall under — they’re not full airplanes, but they’re more than drones. In the US, NASA has been anticipating projects like this by bulking up new research divisions. One, the obnoxiously-named Unmanned Aircraft Systems Integration in the National Airspace System, studies crafts a lot like Uber’s: Larger planes with no pilot. They hand their research over to the Federal Aviation Administration (FAA), which makes all the rules about who can do what and when in the air. The space agency has also been collaborating with Uber for safety standards, too. In France, commercial drones are required to have well-trained operators, some of whom might need pilot’s licenses. Seeing as Uber’s crafts will be swirling living people through the air, odds are the controllers will also need those accreditations. 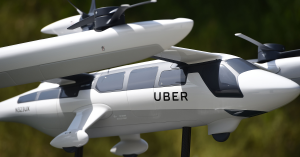 Another regulatory body Uber needs to be cool with is the European Aviation Safety Agency (EASA), which plans to issue guidelines on drones this year. They haven’t said anything yet, making Uber’s planning for European law kind of tricky. If Uber is to make their ambitious 2020 testing deadline, they need the EASA’s rules sooner rather than later. Or, if everything goes the way the company’s self-driving car program has gone, maybe the EASA can take all the time they need.